10 reversals and paradoxes of a season of great adventure. 1. HHHT readers are probably familiar with The Proclaimers song Cap in hand, one small (i.e. 2) number of rock and pop songs to feature The Hibees. "I can understand why Stranraer lie so lowly, they could save a few points if they signed up Hibs goalie"
This season Stranraer saved a few points (3 to be precise) by beating Hibs at Easter Road in the league. 2 The previously mentioned goalie continued the tradition of Goal keeper/poet-philosopher by appearing in the national press with pillars of the Scottish loyalist community and a selection of artistic UVF banners. There must be substantial bad kharma (copyright G Hoddle) at work on Andy who is currently re-incarnated/employed as the boy that picks them out of the net at Motherwell. 4. Wacko Jacko the reformed radge has changed his position yet again from the Big boys made me be the Hearts mascot" to "Ahve always wanted to play fur the Hearts"
5. The curse of the Jacko continues as another ex member of the Hibee "Jackson 2" (Chris) dumps us from the Scottish cup while playing for the third crappiest team in the second division  spooky. 6. Keith Wright, true Hibby that he is, scores the goal that confirms Hibs as Division champions  remarkably, he does it whilst playing for Morton. 7. Hibs fans relax after Lexo proves not to be the one that got away. He fails to set the Aberdeen heather on fire and seeks alternative employment. In the 1992 Scottish Cup final (Rangers Vs Aberdeen) Alex Miller was stretchered off, the victim of one of the most bizarre self-inflicted injuries in Scottish football. There seems to be no basis to the rumour that he waited 17 years to wreak a terrible vengeance on Aberdeen. 8. 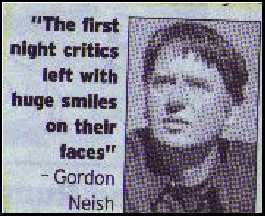 In order to beat the hammer throwers of Airdrie four times in a season we had come down to their level (i.e. first division). All is not doom and gloom for Airdrie. With Gary centre spot Mackay in charge, the trophy for best stadium in the second division beckons. 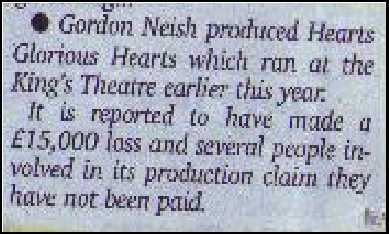 Art imitating life (or at least Edinburgh football) The entrepreneur behind this worthy endeavour, Mr Gordon Neish (see cutting) states without a trace of irony that "The first night the critics left with huge smiles on their faces"
There was no mention of how far into the production they walked out! 10. At an end of season thanks to Hearts for demonstrating that rather than breaking the mould of Scottish football they are merely covered with the stuff.